For Eric Hill, an American adventurer with a flair for doing daring deeds, executing a back flip is not difficult. He clears out space, builds momentum with his arms and launches toward the sky. The flip is part of the 30-year-old's routine everywhere he goes. He is on a remarkable mission: to visit every U.N.-recognized country in world record time. He also does a handstand and receives a high-five from a local in each place. 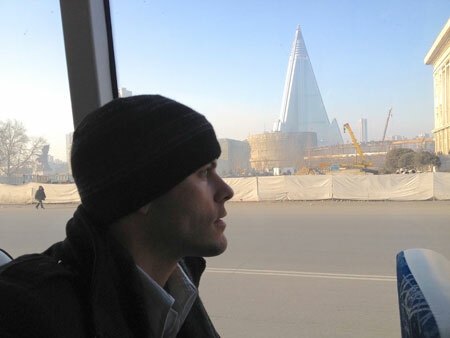 The tasks were anything but easy, however, when Hill's journey took him to North Korea, one of the world's most closed-off societies. "You wouldn't believe how difficult it was to get those things done," he said in an interview in Seoul, Sunday, a few days after leaving the Stalinist state. "First of all, they don't understand what a high-five is." Ever intrepid, Hill eventually completed his checklist, with the flip and handstand during a visit to the northern side of the tense Demilitarized Zone (DMZ) separating the Koreas. But he felt the bigger accomplishment was to observe and interact (to the extent possible) with North Korean people, who he feels are misunderstood by the world. North and South Korea were the 10th and 11th countries he visited, respectively, on the mission he hopes to complete in under three years, which would make him the fastest and youngest to complete the task. He is documenting the trip on his website www.gowitheric.com and has lined up sponsors. Hill plans to seek out adventures in every country in a bid to "show that awesome exists in every country." This includes action sports such as BASE jumping (leaping from high areas with a parachute) in Switzerland, climbing in Nepal and dirt biking in Central America. In China, he did a handstand on the Great Wall. The record chase is "kind of a hook," he said. But "the most important part of the project is to show that there are awesome people in every country." In North Korea, the American said he was aware that the sites he was taken to, and the interactions he had, were tightly monitored. But he was surprised by the warmth of the locals. "Everything that I watched (beforehand) really played on the crazy nature of North Korea, how repressed it is. So I thought everybody would have a stone-cold look on their face," he said. "I guess I have a skewed view because I am looking for the good. In North Korea, I felt it wasn't as bad as I thought it would be. Their kindness was amazing to me." The impoverished state, which is again butting heads with the international community over its nuclear weapons program, has opened to more tourism in recent years. An estimated 4,000 Westerners now visit every year. The increased numbers, analysts say, may reflect a growing interest in the country following a string of high-profile events including the 2011 death of the late dictator Kim Jong-il. While there is some debate on the purpose of visiting the North, many analysts say tourism helps increase North Koreans' exposure to foreigners. Traveling with a group organized by Uri Tours, a U.S.-based travel operator, Hill did not attempt any daring physical acts. He did, however, get the rare opportunity to see the embalmed body of Kim Jong-il on the dictator's Feb 16 birthday. Military personnel, diplomats and citizens filled the Kumsusan Palace of the Sun, where the body lies, to pay their respects on that day. Visitors were allowed to approach the body to within a few feet and bow to the body three times, Hill said, adding, "That was wild." One spontaneous moment came when Hill visited Pyongyang's new skate park, where he found an opportunity to complete his objective of getting a high-five. "One kid fell and so there was a cluster of kids. 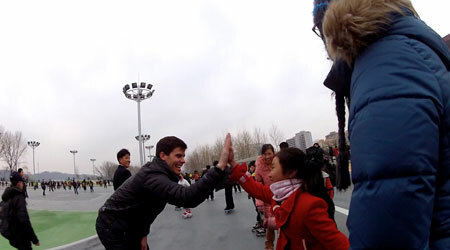 A girl did something cool on her skates, so we showed her what to do (for a high-five), and she followed suit." As for the back flip and handstand, Hill said he had to wait for the right time because many of the sites were focused on deceased North Korean leaders, and that the atmosphere was not right. 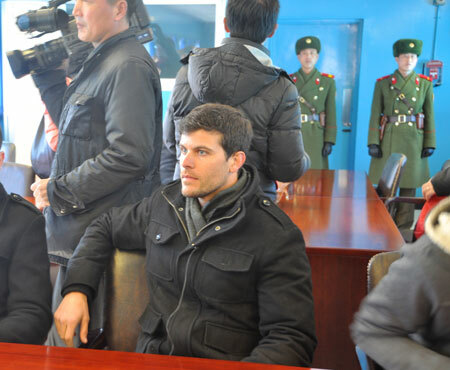 He bided his time until they reached a tourist observation deck at the DMZ. "I just kind of cleared everybody out of the way, raised my arms up and gave a good solid back flip," he recalled. Hill, who owns a home security business in Southern California, says a documentary chronicling his adventures could be on the way. In the South, he has eaten live octopus and plans to "speed fly" ­ akin to paragliding but with more maneuverability. He will then head to Switzerland, and after returning to the United States for a time, to Africa and the Middle East, including Iraq, Iran and Afghanistan. The adventurist said his biggest takeaway from North Korea and other places is that people are generally the same despite political or other tensions. "You can't understand a place until you actually step foot there and see what the people are going through. I have not found one exception to that rule, where what I thought was what I expected. "Everybody thinks there is lot more than we can see (in the North), and that's probably true," he added." But there is a lot of good there," he said.